[141 Pages Report] The automated container terminal market was valued at USD 8.84 Billion in 2017 and is expected to reach USD 10.89 Billion by 2023, at a CAGR of 3.7% during the forecast period. The base year used for this study is 2017, and the forecast period considered is between 2018 and 2023. The automated container terminal ecosystem comprises companies such as Cargotec (Finland) , Konecranes (Finland), ZPMC (China), Liebherr (Switzerland), ABB (Switzerland), Künz (Austria), CyberLogitec (South Korea), IDENTEC SOLUTIONS (Austria), Camco Technologies (Belgium), and ORBCOMM (US). 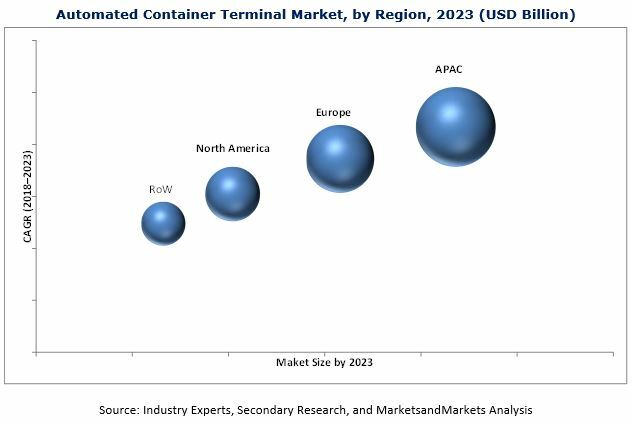 The overall automated container terminal market is estimated to grow from USD 9.09 Billion in 2018 to USD 10.89 Billion by 2023, at a CAGR of 3.7% between 2018 and 2023. The growth of this market is being driven by the growing demand for large container ships, increasing labor cost in developed nations, and growing competition among container terminals. The report covers the automated container terminal market segmented on the basis of the degree of automation, project type, offering, and geography. 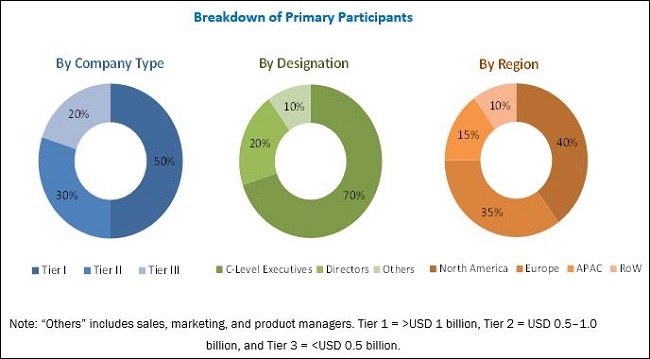 The “services” segment is expected to hold the largest size of the market, based on offering, by 2023. Services are important for the proper functioning of equipment. In automated terminals, even a minor defect in any equipment can cause a serious loss of productivity. Therefore, the service contracts are increasing in number, thereby driving the growth of the market for the same. “Semi-automated terminals” held a larger size of the overall automated container terminal market based on the degree of automation. The adoption of semi-automated terminals is increasing rapidly compared to the fully-automated terminals as the investment required for building a semi-automated terminal is lower than that for the fully automated terminals. In the developing regions such as APAC, South America, and Africa, the significant increase in the investments for the development of semi-automated terminals is fueling the growth of the market for these terminals. The automated container terminal market for the brownfield projects is expected to grow at a higher CAGR during the forecast period. Increasingly stringent environmental regulations by the governments affect the implementation of greenfield projects in the developed countries. Companies are working on various projects to automate the existing terminals partially or wholly to help with cost saving and maximum utilization of resources. The automation of existing terminals is advantageous due to access to low-cost resources and existing infrastructure. APAC held the largest size of the automated container terminal market in 2017. Rapid industrialization, increasing maritime trade, and growing investment in ports and terminals to achieve operational efficiency are the factors fueling the growth of the market in APAC. The automated container terminal market in APAC is expected to grow the highest CAGR during the forecast period. Europe is the second-largest market for automated container terminals. The region is an early adopter of automation in ports and terminals. Further, favorable government policies and initiatives in countries such as Germany, Spain, and Italy have encouraged the growth of the market in this region. In addition, some of the leading automated container terminal manufacturers such as Cargotec, Konecranes, Liebherr, and ABB are present in the region. In recent years, though automation at ports and terminals has emerged as a potential technology that increases productivity and enhances the operational efficiency of the terminals, it also encompasses a few drawbacks that hamper its market growth. The major hindrance to the growth of the automated container terminal is the requirement of high initial investment cost for the implementation of automated container terminals. A huge amount of investment is required for building a new terminal, and even more money is required for the modernization of the existing one. Further, the replacement and upgrading of existing equipment and software systems also require a huge amount of investment. Cargotec (Finland), Konecranes (Finland), ZPMC (China), Liebherr (Switzerland), ABB (Switzerland), Künz (Austria), CyberLogitec (South Korea), IDENTEC SOLUTIONS (Austria), Camco Technologies (Belgium), and ORBCOMM (US) are some major companies operating in the automated container terminal market.